There's the blues. There's also blues-rock, blues-rawk, blues-punk and, of course, the blooze. Then there's something that is much more sinister, foreboding and scary as hell. Something that may have the blues as a steady part of their diet but like water, it is just the base ingredient. Bands like the Birthday Party, the Laughing Hyenas and Chrome Cranks huffed and guzzled such concoctions in the past and California's Musk have figured out the formula for themselves too. After what sounds like a circus being run of out town and over a cliff by spaceships on opener "The Hidden Cost" a murder spree starts with "Wet Brain." Full of serrated guitars alternate between recklessly sawing away at tendons or blowing up a dam full of blood while a man possessed howls something that sounds somewhere between Lux Interior screaming for dear life and a snake charming preacher drunk on a serpents venom, the song is where all kinds of creepy dreams begin. 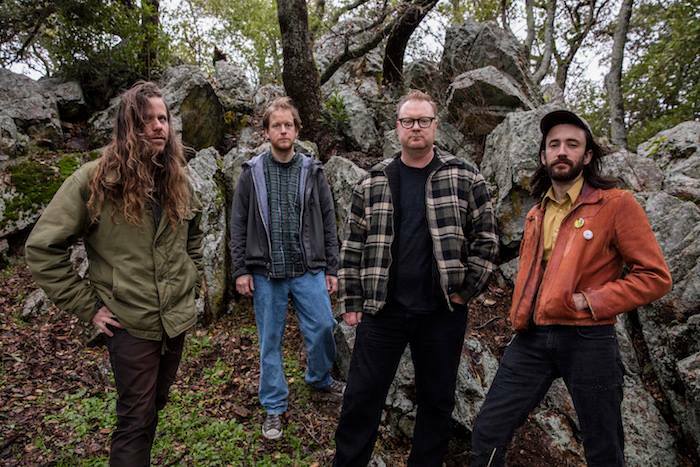 Fuzz coated and mildew laden freak fest like "Raw Night" and the drunks fist flying boogie of "Hip Pain" come barreling out like a runaway train loaded with a raw sewage payload, smashing everything in its path. Meanwhile, a panicky "Catch And Release" kicks rockabilly music in the head with a work boot and tangles your worthless soul into a slimy and sticky web of spidery guitar lines. When it seems the band might play it a bit straight things are still messed up. "Weathervane" may remind some ears of Neil Young and Crazy Horse but after a minute or so in it's more like them being tied together at the ankles and then dragged alive behind the hearse that Neil wrote "Long May You Run" about. When they do a take on the Paul Anka song "Crazy Love" it sounds more like a murderer making a non remorseful but disturbing confession and their version of The Savages "The World Ain't Round (It's Square)" takes the teenage snot and rage of the 1960's original and drops into the even more brutal and bitter modern world. The first Musk album blew my head off. For this second go round they have decided to stomp on the grey matter and kick the bloody parts all over the walls and window. I dunno how many times I have told myself that I am gonna sit down a write a song everyday. Sure, it sounds good and impressive but it never happens. Coming up with a song everyday is not very easy. That is, it seems, unless you are John Wesley Coleman III. Releasing solo records as well as his playing a major role in the band the Golden Boys, Wes can pen a good a tune at a decent clip. 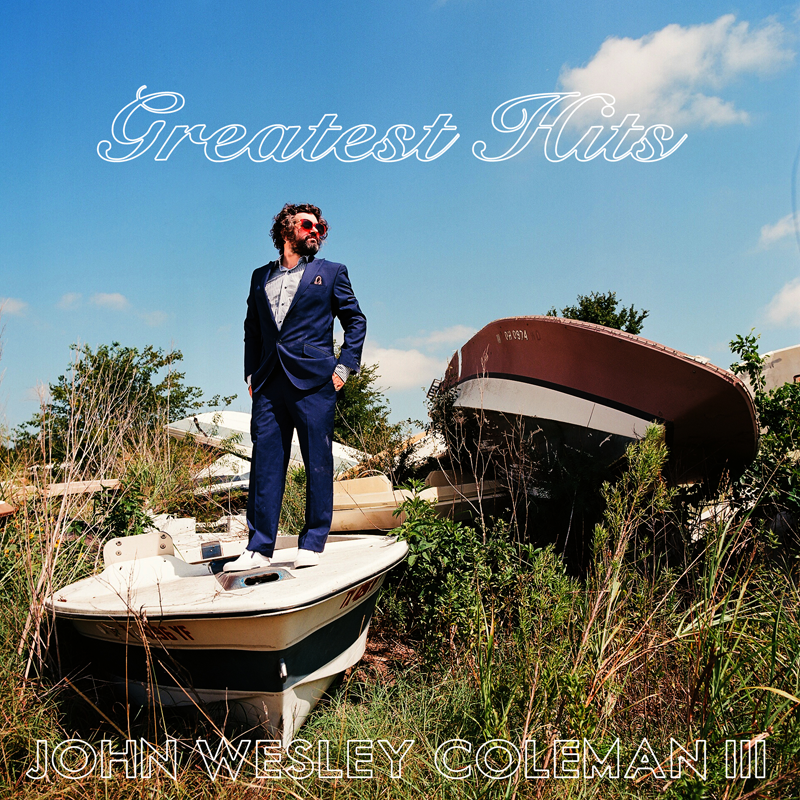 His latest, titled Greatest Hits is not a collection of previously released songs. It could possibly be the greatest hits of the mountain of songs he most likely created fairly recently. On the cover of the record, Wes stand on the bow of an abandoned boat left in a field. He's dressed like a yachtsman on his way to fancy dinner party. In one pocket a flask and a dime bag in the other most likely. In some ways that conveys the moods of the record. It may be time to show some maturity and responsibility (after all, he's a dad now) but there's always going to be some scruff and rabble that comes with it. Actually, still quite a bit of scruff and rabble as the slightly cheesey/kinda sleazy riffed opener "Bong Song" displays. The song juxtaposes a brightly chromed and hi-performance Camaro Rock chug with drunken handclaps and a ratty buzz that sounds like it's about to get completely engulfed in corrosion. 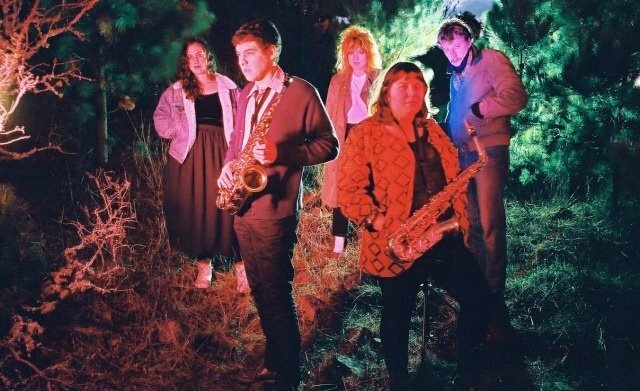 A similar sanguine unkeptness is all over the south of the border meets 70's horn driven pop "Portlandia" and "Miranda," who's rumbling bass line is straight out of punk rock song but a woozy sax and whirling organ make it seem like a carnival setting circa 2nd album Springsteen if he drank less milkshakes and smoked more weed. When things take on a folkier strain such "Tea and Sandwiches" and the practically lilting but darkly lit "Pick Up Your Phone" they're still frayed around the edges. Actual dirt and dust flying around where it would probably enough to send Lumineers fan back into the hiding in the corner of a coffee house and discuss the way people were dressed in the "Come On Eileen" video. Throw in a country weeper that feels absolutely sincere and real as should be while also sounding equally cracked in the head like "Falling Outta Love" and some downright introspective crooning about yard work called "Lawnmower Man" and you have a whole new slew of songs to pick from if and when an actual JWC retrospective does ever come out. Summer is starting to wind down but the parties are still hot. No better time than to have one up in Sanilac county. Great food, a whole lot of taps of fine Michigan beer, an evening August breeze coming in off of Lake Huron and Franck & yours truly spinning blasts from the past and messages of the future for your dining, drinking and dancing pleasure. Come up and groove the evening away just a little south of Lexington on August 27. 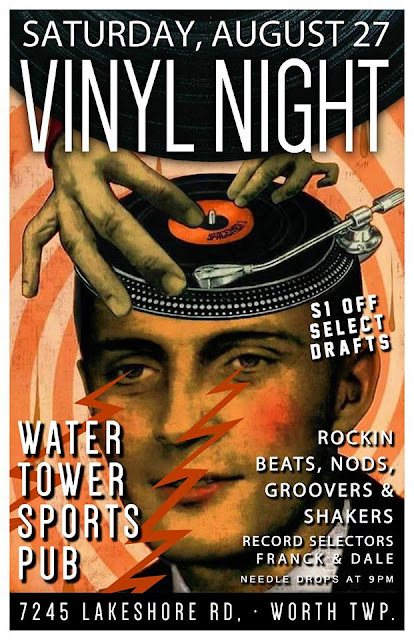 It's Vinyl Night at the Water Tower Sports Pub! In my high school days I didn't ever really get bummed when someone referred to me as a New Waver. There was less contempt and punches in the face for such compared to the attitudes toward anyone who claimed they were a punk rocker. If the music was a bit enjoyably strange or weird you could just call it new wave too instead of waiting for the rare cool zines to trickle in and telling what genre to consider it. It you could dance to it was a bonus. I know for sure that Oakland, California's The World get things like post-avant-punk-funk thrown at the but it this was 30 years ago, they would've been a new wave favorite of mine. Sounding like a tug of war between downtown skronk-meisters who show contempt of everything for the sake of art and suburban raised mutants who dream of hearing a song their wrote echoing off the walls of the local roller rink, the four songs here are sublimely odd. The record's lead off, "Managerial Material", does a fidget wiggle out of the speakers and immediately entertains as well as confounds. The dual sax players, one that sounds like it has a penchant for fog horns and steam whistles and the other seemingly addled but still intent on making some "good time" music, a like a parade marching band wandering off it whatever direction they chose. What keeps those horns from wanted off a cliff is, is the tight and twisted band that engulfs the sound around them. F'instance, the blurts "It Takes 2" may sound like radioactive dosed goose calls but it's the A Certain Ratio type of exposed electrical wire zap groove from them that provides a thud-n-sway for the singer bark and coo and make the listener wonder whether Su Tissue and Ari Up haunt her dreams every night. That and you can dance to it!